Infatuation with arresting beauty has always compelled artists to produce masterpieces and four superb works are included in Christie’s 250th anniversary sale, Defining British Art, to be held in London on the evening of 30 June 2016. Sir Joshua Reynolds’ Portrait of Lucy Long, Mrs. George Hardinge (1820) encapsulates that of a ‘society beauty’, being one of the finest works by the artist to come to the market in a generation (estimate: £2,000,000-3,000,000). Accompanied by her spaniel in the foreground of the canvas, Lucy Long’s stoic and elegant demeanor is captured as she gazes pensively onwards, producing an informative portrait of an esteemed figure in 19th century Britain. Portrait of Jane Morris, bust-length (circa 1870), her unusual appearance was strikingly at odds with any conventional notion of feminine grace, yet Rossetti captured her with an unprecedented, tasteful and irresistible intensity - providing a breathtaking portrait of his flawless lover. Formerly part of a significant collection owned by L.S Lowry and was sold by his heirs, this coloured chalk on light green paper is estimated at £300,000-500,000. Pavonia (circa 1859). Producing a work of art contrasting to that of his contemporaries, Leighton captures a sensuality in the serene but confident sitter. Focusing solely on the physicality and subject of his striking Mediterranean model, Nanna Risi, we are not desensitised by exaggerated foregrounds or additional features, but gripped by her exotic beauty, juxtaposed with the magnificent display of a peacock fan, a timeless symbol of vanity (estimate: £1,500,000-2,500,000). The fourth muse replaces the colour and seduction of her predecessors for a quaint charm which is as wholly appealing and mesmerising. 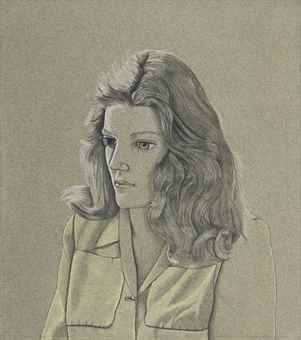 Lucian Freud’s A Girl (Pauline Tennant) (circa 1945), conveys an obvious stillness in its depiction. Pauline Tennant, portrayed truthfully to her rather unconventional personality and described as “a true bohemian aristocrat” (Phillip Hoare, The Independent) appears carefully delineated upon a muted canvas but animated in both beauty and psyche (estimate: £2,000,000-3,000,000).